This article was published by ComputorEdge , issue #2728, 2009-07-10 , as the cover article, in both their PDF edition (on pages 5-14) and their website. For typical computer users, there may be a number of applications that they utilize on a daily basis; but possibly the most critical one — aside from a Web browser of some sort — is an office productivity suite, usually consisting of related programs for creating documents, spreadsheets, presentations, and in some cases databases and drawings. Even though much of this functionality is gradually migrating from the desktop to the Web (witness Google Docs), most of that work is still being accomplished locally, on personal computers that don't have to be connected to the Internet. This is especially true for professional work done inside of corporations or other organizations — the majority of which do not yet trust "the cloud" (Web storage) for safeguarding their business-sensitive data. In the realm of office productivity suites, the dominant player has long been Microsoft Office, which can trace its origins to the early 1990s, during which time it was battling — and eventually vanquished — competitors such as WordPerfect and Lotus 1-2-3. By the late 1990s, the marketing juggernaut from Redmond had prevailed, and the term "office productivity suite" had effectively become synonymous with Microsoft Office. 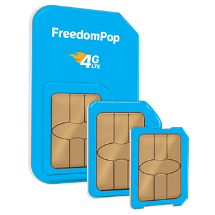 Yet many users and industry pundits frequently pointed to the superior features of the products that had fallen by the wayside. They also decried how, with each of the nine major releases of Office (versions 3.0 through 2007), the package has demanded ever-increasing licensing costs and consumption of disk space and system memory, all to deliver features that are rarely if ever used. The inevitable backlash has taken the form of alternative office suites and individual programs, such as word processors and spreadsheet applications. 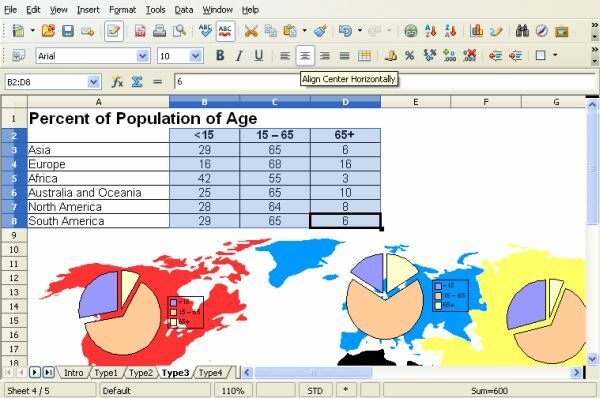 The most well-known all-encompassing package is OpenOffice.org, which bills itself as "the leading open-source office software suite for word processing, spreadsheets, presentations, graphics, databases and more." On the surface, it certainly possesses some appealing advantages over Microsoft's offering. For one, it is completely free, versus the sticker price for Office, which ranges from roughly $150 up to $680, depending upon the particular edition. 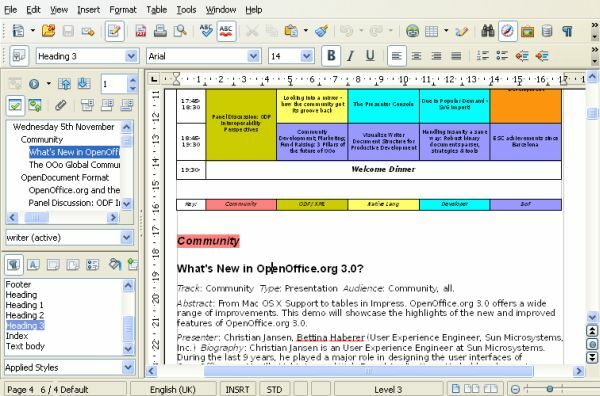 In terms of functionality, fans of OpenOffice.org contend that it possesses all of the features that people normally need in an office productivity suite, without the unnecessary complexity, security problems, and Microsoft lock-in of its better-known rival. In addition, it possesses almost all of the features found in its non-free counterpart, StarOffice, which is distributed by Sun Microsystems (now part of Oracle). To get a better idea of what OpenOffice.org has to offer, let's take it for a test spin. I will be using version 3.0.1, the latest as of this writing. The first step in trying out OpenOffice.org is to visit its home page, and click on the download section, indicated by the green arrow. When the installation file has finished downloading, open the file, and then step through the installation dialog boxes. The default selections should work fine for most if not all users. After the installation process is complete, you can start OpenOffice.org by selecting it from your Windows Start menu — or the icon on your desktop, assuming that you did not decline to have it added there during installation. 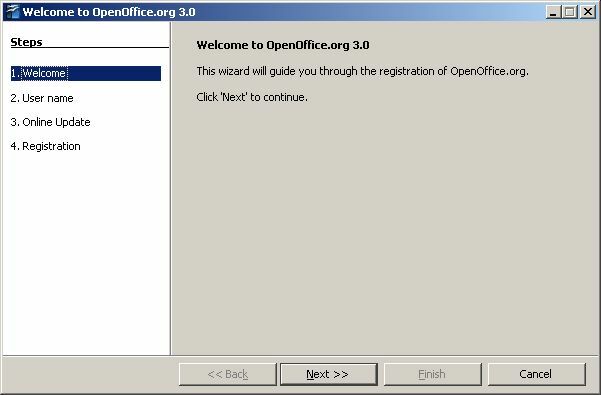 The welcome dialog boxes will ask you for your name and initials, whether you want the program to automatically check the OpenOffice.org website for updates (none of your personal information is transferred to the site), and whether you would like to register (which helps support OpenOffice.org by increasing the number of registered users they can claim). After the program has started, you are shown a welcome screen, at which point you can create a new text document, spreadsheet, presentation, drawing, database, or math formula. There is also a button for viewing all of the existing templates, and another button for opening an existing document. I will next explore in more detail all six of the major components that compose the suite, with emphasis on the first two. In so many ways, Writer is quite similar to Office — with all the features that one would expect to find in a major word processor: font faces and sizes, text formatting options, paragraph styles, tables, spelling and grammar checking, automatic correction and formatting, table of contents, indexing, macros, mail merge, customizable settings, export-as-PDF functionality, online help, and much more. For the longest time, Word stored a document's contents in a proprietary binary format, making it quite difficult for users and developers to access the contents programmatically. With Word 2007, Microsoft introduced its own standard (naturally), Office Open XML. In contrast, OpenOffice.org has, from the start, stored all data in open XML formats. In version 1.x, the default file extensions were ".sxw" for documents and ".stw" for templates. Version 3.x utilizes OpenDocument file format (ODF), an open standard format growing in usage and popularity. Documents can also be saved as HTML, plain text, RTF, and several different versions of StarWriter and Microsoft Word. By the way, all of these XML-based formats are actually ZIP files. One glaring omission from Writer, is the lack of an equivalent to Office's outline view, which can be invaluable for organizing documents in a hierarchical format, and collapsing and expanding sections as needed. Proponents of Writer point to the Navigator panel (Edit > Navigator) as a substitute, because it allows you to promote/demote sections, and move them up and down within the document, without having to cut and paste sections of text within the document. But I found it to be a pale shadow of Office's outline functionality, which allows selective expanding and collapsing of text — the main benefit of outlining. 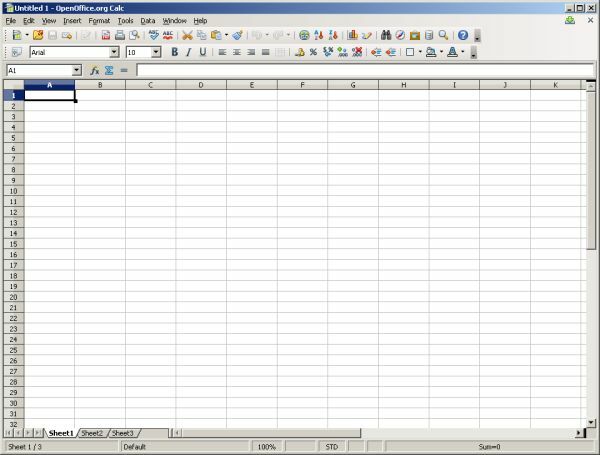 OpenOffice.org's answer to Microsoft Excel, is Calc. It has most if not all of the features offered by Excel, including macros, which are organized into nine groups: Depot, Euro, FormWizard, Gimmicks, ImportWizard, Schedule, ScriptBindingLibrary, Template, and Tools. To start a new spreadsheet in Calc, simply click the "Spreadsheet" button on the welcome screen. Like Writer, Calc has built-in formatting and styles, as well as the ability to embed images and other objects. 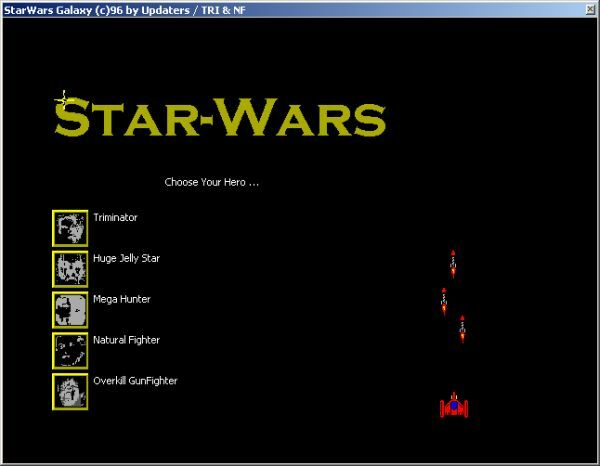 Working on spreadsheets may be dry and dull, but Calc does have a playful side, in the form of a computer "Easter egg": In any cell, type in =Game("StarWars"), to start up a small game similar to Space Invaders, the classic video game. The only downside to the game is that the response time of the rocket firings is quite slow… or so I've been told. Even though documents and spreadsheets are the most common types of documents created using office productivity suites, there are times when nothing can take the place of an eye-catching presentation, an attractive drawing, a well-structured database, or, on that rare occasion, a math formula. OpenOffice.org can answer all of these needs. To put together a multimedia presentation, consider using Impress, which supports numerous fonts, clipart (two-dimensional and three-dimensional), animation, drawings, and special effects. You can create a new presentation from scratch, or by using a template wizard that steps you through the process of selecting such options as background colors and patterns, presentation title, image display speed, and more. When you are all finished, your complete presentation can be saved as a PDF file, an HTML page, or even as a Flash movie. If you need to develop a drawing, you don't have to resort to Microsoft Paint, the applet built into Windows. 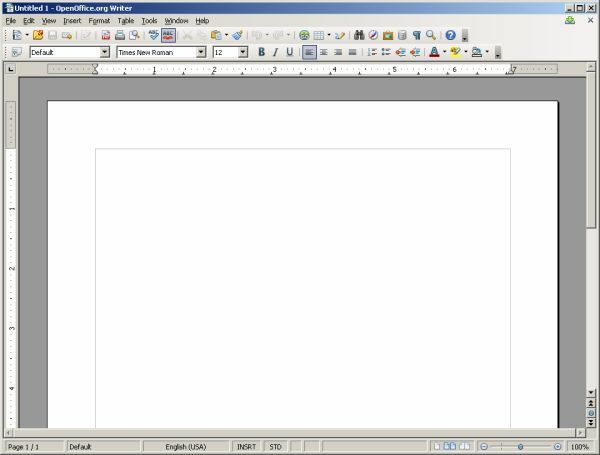 OpenOffice.org has Draw, which makes it possible to create everything from simple drawings to sophisticated diagrams and graphics. It allows you to manipulate objects, rotate them in two-and three-dimensional space, and create photorealistic images utilizing sophisticated rendering. Furthermore, if the drawing that you are creating is some sort of diagram — such as an company org chart or software flowchart — you can use Draw's smart connectors to link together all of the constituent components. In most cases, you can avoid having to download and install a dedicated diagramming tool. Creating a desktop database is usually a real chore — if not a daunting challenge — and Base makes it much easier to create and later modify tables, queries, forms, and reports based on that data. The default database engine is Base's own built-in HSQL, or you can use a different one, though it is not obvious as to how to specify which engine to use, in the database creation wizard. You can view your data using design views, wizards, or SQL, for those people who understand how to write such queries. While the need to create a mathematical formula is typically limited to the academic world, if such a need arises, you can try using the Math program built into OpenOffice.org. It supports the importation of externally-created formulas that have been saved in one of several formats — ODF, OpenOffice.org 1.0, StarMath, and MathML. Google Docs was mentioned earlier, and anyone who has documents stored in that system, or would like to export documents from OpenOffice.org and move them up into "the cloud", be sure to check out the Download Squad article that explains how to transfer documents back and forth between the two systems. This information should be enough to get anyone started in trying out OpenOffice.org, a promising alternative to Microsoft Office. What a wonderful site you have! It's clean, clear and full of excellent content [...]. I'm very impressed! [...] You certainly put a lot of expertise, talent and care into all of your sites.